Written by: Victoria Irwin on January 13, 2014. 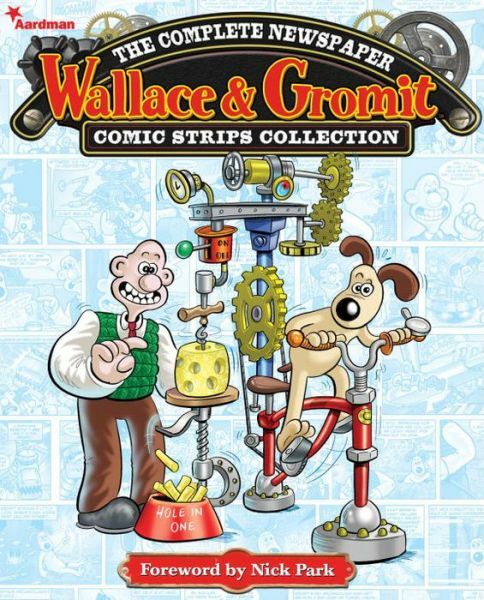 Recently released from Titan Books, The Complete Newspaper Wallace & Gromit Comic Strips Collection is a must have for all fans of the loveable claymation franchise. Featuring Wallace, a crackpot inventor with a love for pun, and his intelligent saves-the-day dog Gromit, the comic strips were featured in The Sun newspaper. The comic strips are small, with three to a page. All high-light a series of puns related to the actions involved. These range from inventing a machine to make pastries at the speed of light to a robotic maid that goes haywire. Very few things seem to go right in Wallace’s hands, but Gromit is always by his side to fix the mistakes and keep the town from being attacked by haphazard machines. The hand-drawn strips are kitschy and adorable, drawn for cartoon status and not in an attempt to be anything that they are not. They are comic strips through and through. Interspersed between these are the occasional two page breaks featuring an image from the original claymation productions. As a fan of the loveable British franchise, I can’t recommend The Complete Newspaper Wallace & Gromit Comic Strips Collection enough to fans. It can be a bit difficult to read that many puns back to back, but the book is an enjoyable collection and appropriate for adults and children alike.